In four separate elections, more than 120 healthcare workers voted to join NUHW. The elections expand our growing presence at Keck Medicine of the University of Southern California and Marin General Hospital, where our members have already won strong contracts for our members. At USC, our newest members include technicians at a sleep disorder center, licensed vocational nurses, medical assistants and clerical workers at an internal medicine clinic and call center workers. At Marin General, 28 pharmacy and medical technicians voted to form a union with us. They voted to join NUHW, at the same our members at the hospital were putting the final touches on a new contract that will boost average wages by more than 30 percent over the next five years. 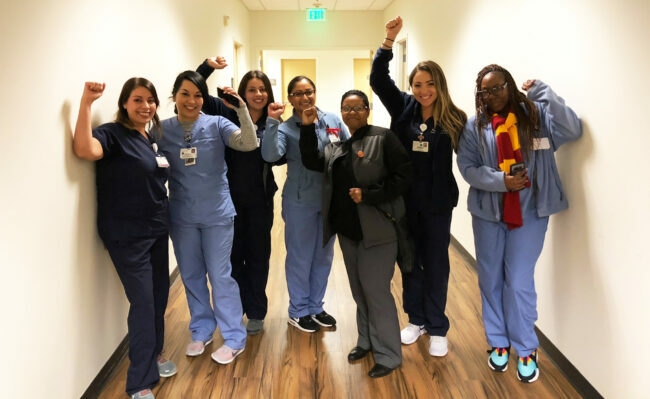 “These organizing victories demonstrate that workers in our facilities recognize that we can empower them to have a voice in their workplaces and win good contracts that improve their lives and safeguard patient care,” NUHW President Sal Rosselli said. While, Marin General didn’t interfere in the organizing effort, USC managers resorted to captive audience meetings and one-on-one discussions to try to quash the organizing drive. However, workers stood firm against the unwanted harassment. Organizing committee members challenged management claims during the captive audience meetings and showed them NLRB guidelines when their rights were violated. Workers at the call center also refused to be intimidated by management. Job security and favoritism are chronic issues for workers, who considered joining NUHW a couple years ago.